← Why Won’t My Seeds Germinate? At At the ends of my long raised beds, tucked here and there through out my yard are silver leaved perennials that look almost prehistoric. They are the artichokes! Reaching up to 4 foot tall with a spread of over 5 feet when full grown. Artichokes are not only grown in my garden for drama, but for there immature seed heads which are eaten cooked. Once cooked they can be served warm or cold with our favorite, melted butter and scraping the tender fleshed petal through your teeth. Artichokes are prized for serving with pastas and Mediterranean dishes. No wonder, they are native to the Mediterranean and have been cultivated for years. As forbidding as the artichoke looks with it’s armor of fibrous, thorny leaves, this thistle bud offers a culinary treasure with a tender, delicious heart. Bear in mind, when planting artichokes, they need a substantial amount of space! Globe artichokes do best in a sunny, sheltered site in well-drained soil, with plenty of well decomposed compost. ‘THE ARTICHOKE IS TO BE PLANTED IN A FAT AND FRUITFUL SOILE: THEY DOE LOVE WATER AND MOIST GROUND.’ Gerard’s Herbal, 1597. 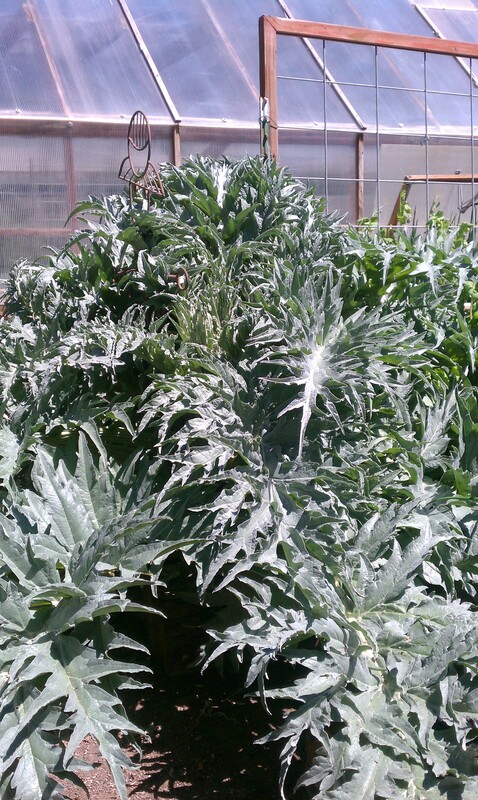 Artichokes grow best in area where the winter temperatures are mild. You can mulch or heap leaves or straw above the roots during winter to help warm the plants. In hot, dry regions, buds can become tough or open too soon. In our hot Southern Utah area they enjoy afternoon shade with moist conditions. Propagation can be done by divisions or by seed. When planting from seed start indoors 8 weeks before the last spring frost at the depth of 1/4″ with soil temperatures of 70-80 degrees and 10-14 days to germination. For a jump start, buy larger plants which can produce chokes the first year whereas starting from seed, it could take a year or more to produce. Don’t be fooled by the looks of your artichoke! They may seem like they would be drought tolerant, but they enjoy liquid! Keep the soil moist. Never allow roots to dry out, but don’t saturate the ground or leave standing water either. If the plants are allowed to dry out and wilt they can become weak and die or their bud production will be few if any at all. 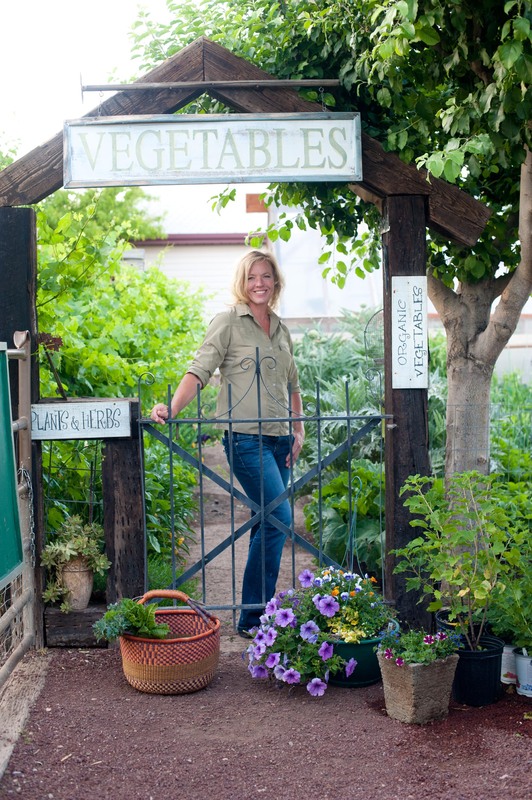 Fertilize when you first plant your artichokes with compost and blood meal. Fertilize established plants in the spring and autumn with a good dose of low-nitrogen fertilizer such as soft rock phosphate and minerals like azomite. In spring time I will apply Kelp Meal made into a tea or just directly around the base every 2 weeks to give the buds a big boost. Pick chokes when they are firm, but not opening up yet for best tenderness and flavor. This is usually mid-summer time. 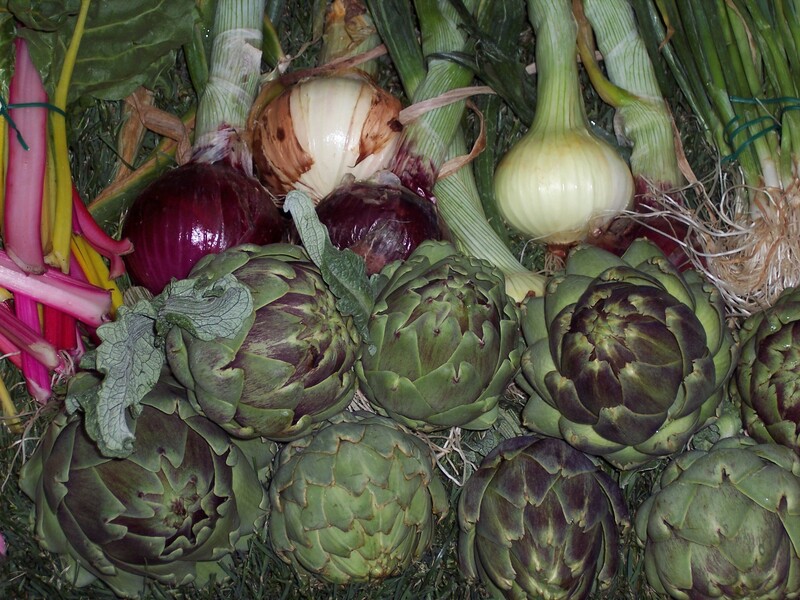 Cut back the stalks as low as possible after all artichokes have been picked. This will send energy to the root system. I even cut out the larger leaves that become yellow and raggedy looking after harvest. If you are growing for the ornamental purposes, the flowers are amazing! I always leave behind a few buds just for the incredibly bright flowers that the bees love too! Aphids can be a problem. If this is the case use a strong jet of water to knock them off. If they persist you can use a insecticidal soap to control them. Another very annoying pest is the earwig. I simply sprinkle Diatomaceous Earth around the base of the plants and also when the buds are forming I will sprinkle it over the bud to prevent the earwigs from entering. Umm…Delish dipping sauce! Try this with your artichokes they next time you fix them. Steam artichokes until tender. 30-50 min. Meanwhile, whisk 1 large egg yolk and 1/2 tsp water in a small bowl. When mixture thickens and turns opaque, add 1 cup olive oil in a steady drizzle, whisking constantly. Stir in 2 T of fresh dill chopped and 2 tsp fresh lemon juice. Season with salt. I am so impressed, I love globe artichokes and if I ever have a bigger garden I would love to grow some!